Pooja Shanker, a specially-abled girl, hails from an Indian middle class family in which everyone is well-educated and holds superior positions in government and in the private sector. Since the age of 15, when her basic understanding of life began, she understood her limitations in the field of formal education. So she started showing her interest in sports. Her special school—Asha Jyoti, run by the parents of mentally challenged citizens of the State of Uttar Pradesh, India—helped her pursue interest in sports. She stared her sporting journey by playing school level games in her home town of Lucknow. In the 100m run in the 2019 Abu Dhabi Special Olympics, she won a gold medal. Pooja lost her mother very untimely, in 2004, to cancer. This was a major jolt to her and the family. Her sincerity to sports was fuelled by a supportive father and grandmother. With her growing interest, persuasion and dedication, she started playing in the district and state level games in 2002. She received her first medal in 2005 at a state-level sports event held at Rishikesh. Thereafter, her desire for achievements grew and she started playing more vigorously and started winning medals at the state and national levels. 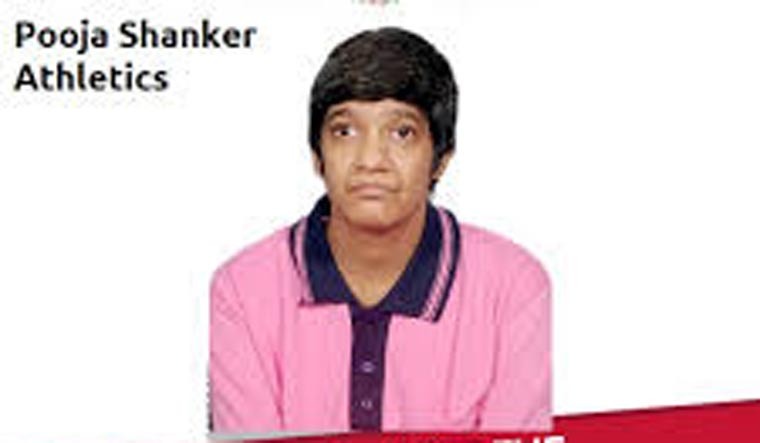 In 2009, she was shortlisted for the 2010 World Special Olympics. She performed very well in the first two selection camps, but, in the final camp, due to the demise of a close relative, her performance deteriorated and she was finally not selected for the Athens World Olympics. This was a great setback for her and she went into a state of depression. She was put on treatment. Then, she was considered for participation in the 2013 Asia Pacific Regional Special Olympics scheduled at Newcastle, Australia. The news of selection to participate had a positive impact; her psychological condition started improving and she successfully cleared all the pre requisites for these games. She finally went to Australia hale and hearty and won a bronze medal in her favourite game—Bocce. But, this was not her concluding dream. She was determined to win gold at the World Special Olympics. Somehow, she could not get a basic selection offer for the 2015 Los Angeles World Games. Fortunately, this time she did not lose her nerves and continued with her normal sports practice. Then, in 2018, she got an unexpected thrilling information about her being shortlisted for the 2019 Abu Dhabi World Games. It was unbelievable, especially after her being ignored for the 2015 world games. The tension was escalating, which also affected her health adversely. But she would practice and whenever a bit reluctant, her father would remind her of her dreams to make her run in the field. Her coaches—Aizaz, Shyam Prakash and Krishna Sharma—were geared up to help her at all points of time. She attended the final training camp at Delhi before heading off to Abu Dhabi.